Be sure to try these old fashioned pudding recipes. Included is the recipe for one of my favorite desserts. Mom often made the lemon fluff pudding in the summertime. It's a colorful and light dessert that's tasty with the tang of lemon sauce. Kept cool, it's a really fine dessert to take on picnics. And you'll love the Pluma Moos too; it will become a tradition at your house. 1. Mix sugar, gelatin, and salt in large bowl. Pour in boiling water, stir till gelatin dissolves, then stir in lemon rind and juice. 2. Speed chilling by placing in refrigerator, stir often. 3. Stir in egg whites, beat until it triples in size, about 10 minutes. 4. Pour into 6-cup mold. Chill in refrigerator. 5. Invert on serving plate and serve with a Golden Custard Sauce. Combine ingredients and cook until sauce thickens or coats spoon, add vanilla to taste. Makes 1 cupful. Freeze an equal amount of shortening until firm, then pulse it in a food processor to create nugget-sized pieces. Butter cannot be used. Mix ingredients in the order given, turn into a greased mold; cover and steam 3 hours. Or put in individual molds and steam 1-1/4 hours. Serve with hard or liquid sauce. Into a buttered pudding dish put a layer of raw fruit — sliced apples or peaches or raspberries are especially good in this dessert. Sprinkle with sugar. 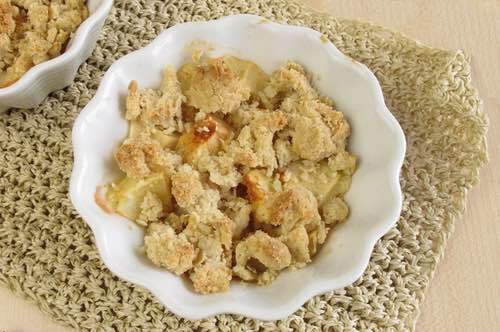 Add a layer of soft, stale bread crumbs, dot with bits of butter, add another layer of fruit and repeat to fill the dish, having a layer of crumbs and dots of butter on top. Bake in the oven, covering closely for the next 20 minutes of cooking to allow the steam from the fruit to moisten the crumb topping. Grandma taught us how to make Pluma Moos, and this is exactly how she said to do it. Place the fruit in a saucepan and pour enough water to cover the fruit. There should be about 2 inches of water in the saucepan all the time. Boil the fruit for 1-1/2 hours, adding water as needed, until the fruit is very tender. Mix the flour and sugar together. Slowly pour the milk into the flour-sugar mixture, stirring constantly until smooth. (I do this in a gravy shaker.) Then, slowly pour into the boiling fruit mixture, stirring constantly until it comes back to a boil. Occasionally when I do this the mixture curdles, but if you keep on stirring the curdles should disappear. Add salt and cinnamon. Cool. When it is cold, add some heavy cream until the mixture is the consistency you want. Serve to an amazed and happy group of people. Pluma Moos is a traditional German Mennonite chilled fruit soup that was made on Saturday for serving on Sunday, a day of rest. Cold or warm, it makes a festive dessert for Christmas or Easter or any occasion. Be sure to try this old fashioned pudding recipe and make pluma moos a tradition at your house. Here is a recipe for Pluma Moos that I have used with good results. Enjoy! Combine ingredients and cook for 15 minutes until fruit is tender but not overcooked. Combine 1/4 cup cornstarch, 1/2 cup sugar, 1 cup cold water, and 1/4 teaspoon cinnamon in a separate bowl; stir well, add to moos, cook until thickened. Sometimes I add a jar of canned bing cherries or add about a tablespoon of cherry jello powder to the cornstarch mixture. Gives the moss a nice pinkish color. Will be making this for Easter weekend! One cupful of sugar, half a cupful of cold butter, a pint of milk, two cupfuls of sifted flour, and five eggs. Make the milk hot; stir in the butter and let it cool before the other ingredients are added to it; then stir in the sugar, flour, and eggs, which should be well whisked and omit the whites of two; flavor with a little grated lemon rind and beat the mixture well. 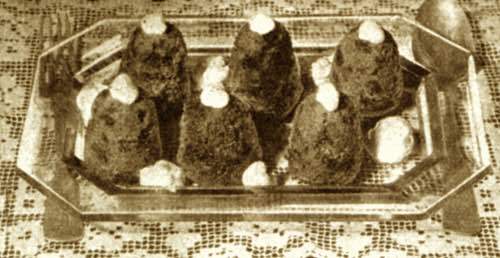 Butter some small cups, rather more than half fill them; bake from twenty minutes to half an hour, according to the size of the puddings, and serve with fruit, custard, or wine sauce, a little of which may be poured over them. They may be dropped by spoonfuls on buttered tins and baked, if cups are not convenient. Take one cupful of butter, two of powdered sugar, the whites of two eggs, five tablespoonfuls of sherry wine (or brandy), and a quarter of a cupful of boiling water. Beat butter and sugar to a cream, add the whites of the eggs, one at a time, unbeaten, and then the wine or brandy. Place the bowl in hot water and stir till smooth and frothy. Naples or Duke of Cambridge Pudding Recipe, with Candied Peel. Candied lemon, orange and citron, each, 1 ounce; butter and pulverized sugar, each, 6 ounces; yolks of 4 eggs; rich puff paste, or well-buttered bread, to line the dish. Chop the candied peel finely, put the rich crust or paste into the dish, else line it with bread well buttered on both sites; then put in the chopped mixture; warm the butter and sugar together, adding the well-beaten yolks, stirring over the fire until it boils; then pour this over the other and bake in a slow oven 1 hour; or, in place of the butter, beat the whites of the eggs also with the yolk, and make a custard with milk, 1 quart; sugar the same, and pour over, and bake 3/4 hour. Remarks: This makes you two puddings for variety's sake — make one way at one time, and the other way next time. You will enjoy trying this somewhat unusual old fashioned pudding recipe as it calls for popcorn. It's a very easy dessert to make yet it tastes quite good. It comes straight from Grandma's kitchen and is packed full of goodness. Sweet milk and popcorn, each 3 pints (each kernel must be popped white, and not a bit scorched, with all unpopped kernels removed); eggs, 2; salt, 1/2 teaspoonful. Bake 1/2 hour. Serve with sweetened cream or milk. Take a small piece of rennet about two inches square. Wash it very clean in cold water, to get all the salt off, and wipe it dry. Put it into a teacup, and pour on it just enough of lukewarm water to cover it. Let it set all night, or for several hours. Then, take out the rennet, and stir the water which it was soaked into a quart of warm milk, which should be in a broad dish. Set the milk in a warm place, till it becomes a firm curd. As soon as the curd is completely made, set it in a cool place, or on ice (if in summer) for two or three hours before you want to use it. When perfectly well made, it always looks greenish. The whey, drained from the curd, is an excellent drink for invalids. 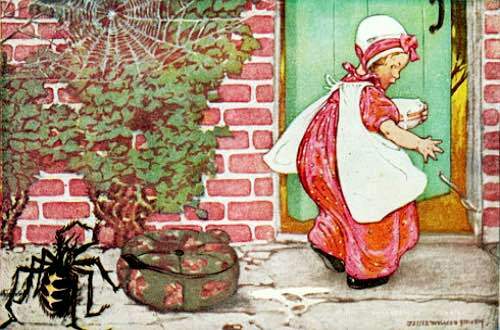 Most of us as children have heard this famous old nursery rhyme, but did you ever wonder what Little Miss Muffet's curds and whey actually tasted like? And what on earth is a tuffet? Well, now you can try this old fashioned dessert for yourself. Slowly bring milk to the boil in saucepan, while stirring continuously to prevent scorching. Once the milk boils, turn off heat and add vinegar while gently stirring. 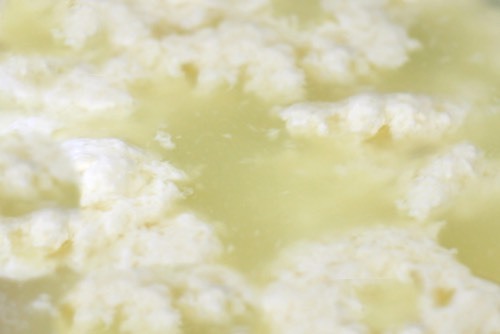 Milk should begin to curdle and become curds and whey. Enjoy trying this historical dessert that dates from medieval times. And in case you are wondering, a "tuffet" is simply a small footstool. Just watch out for the spider!